The nonobjective things that Bernstein has painted onto these six surfaces become lively by their proximity to each other, their simple being-there—like people occupying a void space and coming alive by relation, juxtaposition. This is of course impossible without the viewer’s participation, but that’s an old story. 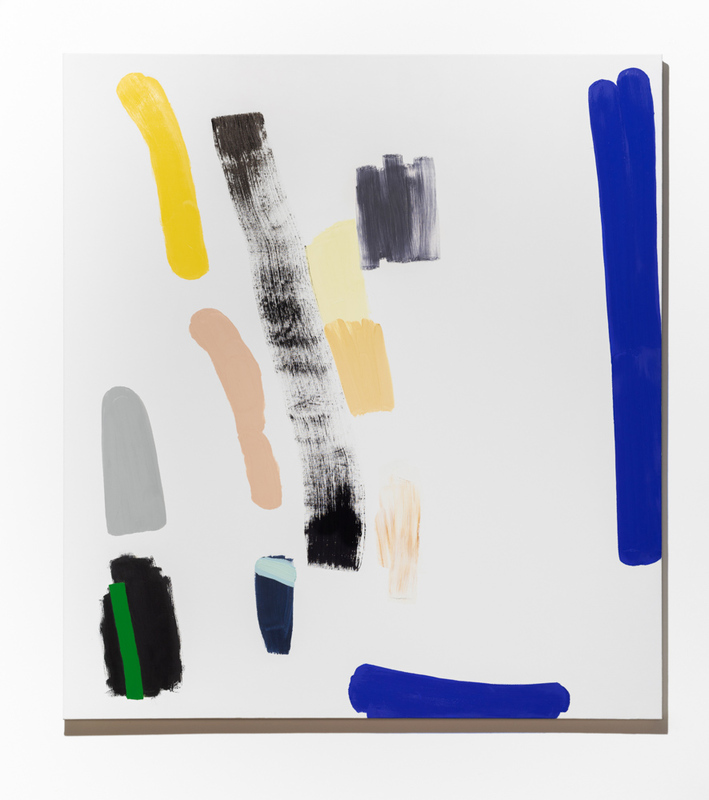 In Buoy (2018), strips of yellow, blue, ochre, green and gray appear as if in flashes, sharing space with coal-colored hunks and faded streaks of black. Some of the marks are layered, stacked or scumbled, and others are independently situated. My favorite of the bunch, The Bridge (2018), is also the the smallest at 22×22 inches. It seems to organize the forms before your eyes and the shapes also seem to stand. This is due to the curtailment of the white part of the painting and the confluence and nearness of the forms. The paint is built up off of the surface, dabbed and looking still-wet, or else smoothed down with a similar gleam. 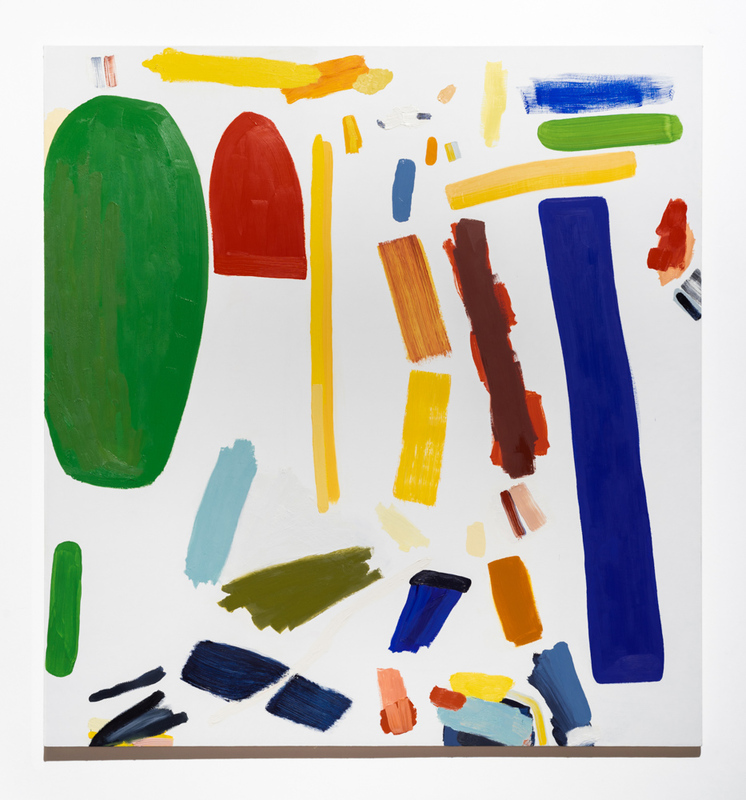 Each painting in this show is made up of these formations, brushes, tumbles or swings of fast color against smooth, painted white backgrounds. The bright backgrounds have been carefully sanded, giving ample space, a flat surface for floating hues. The white translates as light, driving these new forms, like ships, over the surface of the canvases. The titles Fishing (2018), Buoy, and From the Mast (2018) suggest, maybe, a bird’s-eye view of floating objects, but so do certain of Bernstein’s shapes and their contours. Being around these pictures is intoxicating and enlivening: sensation engendering sensation, impression, reverie. You have to be in front of them to get to know them, any mediation here simply will not do, a statement which seems truer here than for a lot of what entertains on any good art-driven Instagram feed. 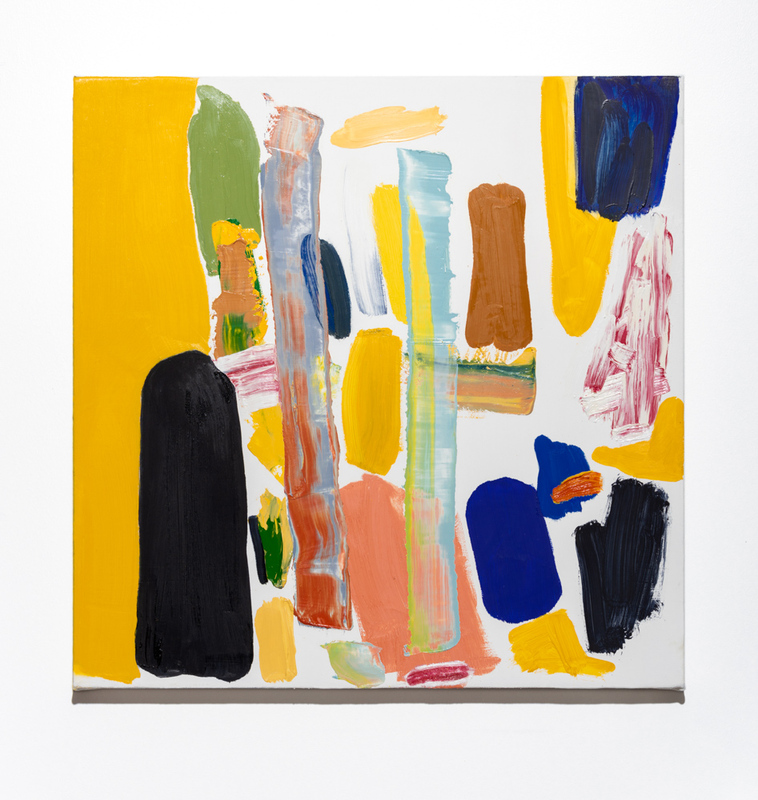 Bernstein finds in her paintings a logic all their own; the paintings resonate but equally allow for the unexpected, like music taken off the sheet, poetry without the old constraints, or dance without a programmed sequence. Bernstein explains, “Painting for me is partially about the possibility of new language, how to get to something that is unusual or strange so as to get closer to the truth of the experience of a time.” She continued to say that she often sees “the crossover between these forms of expression: how sound can relate to shape and color (like punctuation), how much meaning there is in space and volume, like in the lines of a poem. This comes down to the way we read, I guess, but I also think of it in relation to music too.” This brings to mind the long history of synesthesia and abstraction starting with Wassily Kandinsky, one of the early abstractionists who was similarly interested in improvisation. But while Kandinsky insisted on deep spiritual meaning, Bernstein is less doctrinaire. Her approach manages to synthesize her deep theoretical and inventive experience while at the same time communicating the inventiveness and spontaneity with which her compositions were created. Bernstein’s forms and spaces aren’t fixed but in transition, set apart, removed from any horizon that might otherwise recall figures and shapes or spaces reminiscent of the visual world that we inhabit. Bernstein paints on the floor rather than on an easel or wall because she wants to remove any familiar referents that may limit the possibility of new or unexpected meanings. Here, this birds-eye view that seems to be taking place appears to be in the service of upending traditional constraints of landscape. Describing her intuitive process, the shapes that appear on her canvases, and their relation to each other, Bernstein told Eva Lake on KBOO Radio in 2014, that “they exist on the canvas to bring the other ones to life… they don’t exist because of each other but they need each other.” This brings to mind the often generative nature of poetry, where words or references tend to follow, more or less spontaneously, one after the other, initially for the poet and then for the reader. The exhibition is the seventh in the Stumptown Artist Fellowship Program at Stumptown Coffee Roasters, 128 SW 3rd Ave. Curated by May Barruel, gallery owner and curator of Nationale, and curator of the downtown cafe since 2007, the artist fellowship is designed to support artists in the production of high-quality, large-scale works. Bernstein’s work will be up until January 21, 2019.